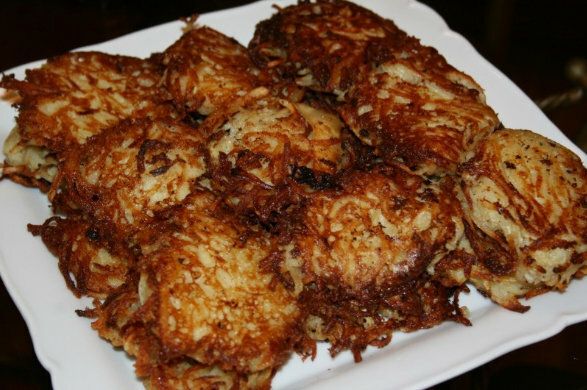 Latkes - Kosher In The Kitch! Latkes - Kosher In The Kitch! Prepare the eggs, salt, matza meal, and black pepper in a bowl. Peel potatoes and onion and cut small enough to fit into your food processor. Using the shredding disc, grate the potatoes and onion, alternating between two as you go. Add grated ingredients to the mixture in your bowl. Mix well. Fry by the spoonful in hot oil (be generous with the oil or the latkes will stick). Tip: the faster the process takes, the crispier your latkes will be. If the potatoes sit for too long, your mixture will become watery and your latkes will be soggy.